Using a recumbent bike is a great way to get a workout without putting unnecessary strain and stress on your body. That's what makes finding the best recumbent bike so important. Due to the innovative design of a recumbent bike, you are able to sit lower to the ground with your legs out in front of you rather than below you. Recumbent bikes also have larger seats with back support. These features allow you to get the same cardiovascular workout that you can achieve from an upright cycle while reducing the stress on your back, knees and hips. While a recumbent bicycle does offer a number of benefits, finding the right one to suit your needs may feel like an overwhelming task. After all, there are many different features that can be found on recumbent bicycles, so how can you choose the one that will best help you meet your fitness goals? To help with choosing a recumbent bike, it is important to consider your fitness goals as well as your lifestyle. After all, you do not want to invest a large sum of money in a machine only to have it sit in a corner and collect dust. Rather, you want to purchase a piece of exercise equipment that you are likely to use on a regular basis. To help keep yourself motivated and to ensure you get good use out of your recumbent bike, it is important to find one that is comfortable and convenient to use that also offers the extra features you need to keep yourself moving toward achieving your fitness goals. By doing your research and learning more about the various features found on recumbent bikes, you will be better prepared to find the one that will help to keep you motivated as you work toward these goals. With this handy guide, you will also be better able to sift through all of your options to find the recumbent bike that is right for you. 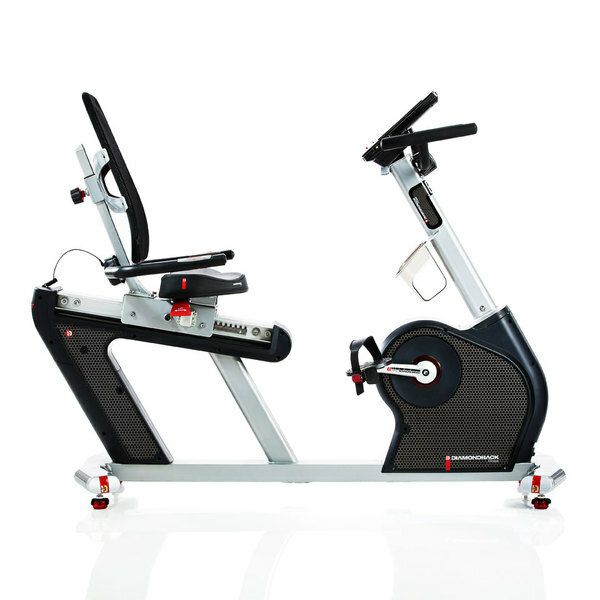 To achieve the greatest amount of comfort while using your recumbent bike, it is important to select a model with an ergonomic design that is meant to help you workout in comfort. Whether you are a seasoned vet looking to add another element to your workout routine or someone who is pregnant, recovering from an injury or simply a bit older in age, an ergonomic design will allow you to workout safely. For even greater comfort, look for a model that allows you to make adjustments to the saddle position as well as the toe straps so you can more comfortably engage the pedals. To get the best views of the console, look for a recumbent bike that allows you to make adjustments to the console-viewing angle. This will help with preventing issues such as excessive glare or neck strain caused by trying to view a console that is in an awkward position. In this way, you can more comfortably using your recumbent bike while effectively monitoring your progress throughout your workout. To achieve maximum comfort with your recumbent bike, you may also need to make adjustments to the angle of the handlebars. This means selecting a model that allows you to tilt the handlebar angle to customize the fit. Not only will this help you make adjustments as necessary for your workout routine, but it also makes it possible for multiple users to comfortably use the same machine to get a great workout. A cooling fan can help with maximizing airflow while you workout, thereby making your routine more comfortable. A fan also helps to prevent overheating, which can be particularly important for seniors or other individuals with health issues who would like to improve their fitness levels. To help with staying cool while you workout, your recumbent bike should have a personal cooling fan with variable speeds. Keeping yourself entertained as you workout is a great way to ensure you keep coming back to exercise. One way to help pass the time as you work out is to reach your favorite magazine while pedaling your way into better fitness. A built-in foldout magazine rack will help you to easily read while you are working out. For added convenience, look for a model that allows you to fold away the magazine rack when not in use. In this way, the recumbent bike will be less obtrusive wherever you choose to place it in your home. Sometimes, the best way to keep yourself motivated is to listen to music while you work out. The most convenient way to play your favorite tunes is to purchase a recumbent bike with a built-in sound system that can connect to your favorite mp3 player. Not only is a built-in system more convenient to use, but it also guarantees good sound quality with the built-in speaker system. Having a quality sound system will make your tunes more enjoyable to listen to, thereby helping to further motivate you to keep working out. Present programs offer a great way to reach your fitness goals without needing to figure out your workout routine for the day. Not only do these preset programs help you to hit different fitness goals, but they also help to vary your routine so boredom does not set in. The best recumbent bikes will have at least 20 preset workout programs from which you can choose. To increase your muscle strength while also taking your cardio to the next level, it is helpful to use a recumbent bike with various levels of resistance. A machine with at least 16 levels of resistance will allow you to achieve a wide variety of different workouts. In addition to helping you reach your individual fitness goals, this feature will also help to make the recumbent bike useful to others who may choose to use the machine and who have different fitness goals. Monitoring your heart rate is one of the key components of measuring the effectiveness of your workout routine. To help make this process easier, your recumbent bike should include a built-in heart rate monitor in the form of an integrated handlebar with contact sensors. It should also have target heart rate programs to help you keep your workout intensity within the target zone. To help create a smooth and quiet ride, your recumbent bike should have a frictionless braking system. The smooth ride will help to keep your workout safe and comfortable, while the noise reduction will help you to better enjoy reading or listening to music while working out. Anyone else who shares your home with you will also appreciate that you are using a quiet recumbent bike that does not create a whole lot of unnecessary noise for them to deal with. Any high-quality recumbent bike will be backed by an extensive warranty. Look for one with a lifetime warranty on the brake and frame as well as three-year warranty on parts and a one-year warranty on labor. This way, you can rest assured the machine will last a long time and provide you with the opportunity to get a great workout for years to come. A reputable dealer will offer a money-back guarantee on any products that you purchase from them. This guarantee should be no-questions-asked and should be good for at least 30 days. Before you purchase a recumbent bike, be sure to closely read the company’s return policy. A reputable company will be open during normal business hours in order to address any questions or concerns that you might have. They will also return all of your money, minus the cost of return shipping and assembly labor charges if you chose to add this to your purchase. There should be no hidden fees charged to you when you make a return. When comparing prices of recumbent bikes, be sure to take into consideration the added cost of sales tax. When purchasing from certain online retailers, you can save money when you do not have to pay sales tax. Many people who consider purchasing a recumbent bike online are concerned that the shipping costs will be outrageous. Unfortunately, this is a very real concern with some retailers. When shopping for the best recumbent bike, consider the added cost of shipping and chose a company that does not charge for this service. Shopping for a recumbent bike can feel like an overwhelming experience at times. This is particularly true if you have never owned a recumbent bike or have never used one before. By going into the process with a clear idea of what you want and need out of a recumbent bike, you will be better prepared to sift through your options so you can choose the one that is right for you. With the added convenience of purchasing a bike online, you can have the machine delivered right to your door so you can get started on your new exercise routine immediately!